The paper starts with examining the standard concept of government expenditure multiplier and finds that in a model of open economy with government revenues and expenditures the multiplier definition is incorrect in so far as the import intensity component relates total imports to GDP, whereas part of imports serves as inputs in exported output. Therefore the value of imports should be related to the value of final output, which is the sum of domestic absorption and exports. Since for most countries final output is significantly larger than GDP, the value of the multiplier is correspondingly larger. Moreover, the paper argues that, the import intensity of exports being as a rule larger than that of domestic absorption, the import intensity of the latter - which is the import intensity relevant for the government expenditure multiplier - is lower than that of final output, which again raises the value of the multiplier. 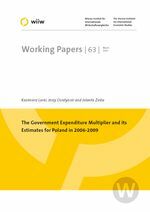 Next the value of the government expenditure multiplier in Poland in 2006-2008 is estimated on the basis of statistics of non-financial quarterly accounts by institutional sectors. The variations in the value of multiplier are found to depend heavily on changes in import intensity of domestic absorption. The value of the multiplier ranges between 1.59 and 1.70 if, in order to reduce the impact of seasonal fluctuations, it is calculated on a quarterly basis, for four consecutive quarters, and between 1.62 and 1.86 if, in order to make the calculations more suitable for economic forecasting, the quarterly coefficients year on year are used. Both sets of multiplier values are slightly higher than those assumed in other countries (1.5-1.6) which may be explained by the rather high import intensity of Polish exports.